Going on a mission to find new waters can at first be a daunting prospect. However, if you think about the possible rewards on offer and the satisfaction that comes with it; the challenge of finding new waters in South Africa is extremely exciting. With an abundance of undiscovered wild waters, a host of farm dams and places that are constantly being overlooked by other anglers; I’m finding that I have to wipe the drool off the keyboard as I’m writing this. Simply keep the tips below in mind when going on your next scouting mission and you’re sure to stumble upon a venue with potential in no time! Carp thrive in a variety of conditions, but usually favour large slow-moving bodies of water with soft bottom sediments. Use this as a general rule of thumb, but I’ve seen carp in park ponds, raging rivers and dams that are situated in residential areas. After identifying a possible venue; go on Google Earth and check out where the inflowing water comes from (e.g. where does the water that supplies the dam come from?). If the dam you’re scouting receives its’ water from a venue that is known to hold carp; well then you’ve just hit the jackpot. Keep an eye out for features where carp would like to hang out. Things like overhanging trees, reeds, snags, a stream entering a dam (bringing with it a host of natural food), etc. Carp are omnivores. Their diet varies depending on what’s available in the specific body of water. However, they eat a wide variety of plant and animal matter mainly by grubbing on the bottom. Carp need protein and are constantly on the lookout for things such as: insects, algae, water plants, nuts (that have fallen from trees), freshwater prawns, crabs, bloodworms, fish eggs, etc. Birdlife is another good indicator that carp might be lurking. Some bird species eat things that carp also eat. Plus, carp also eat bird droppings. So if you don’t see carp, but see loads of birds; you might just be staring at a future fishing venue. Be vigilant and look for signs of other wildlife species. 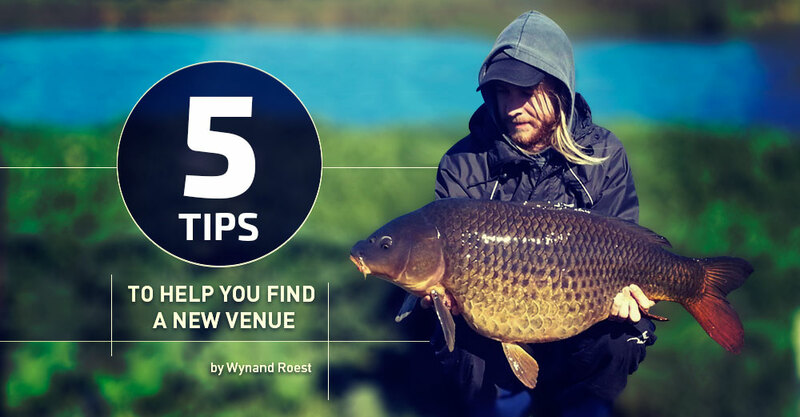 Identifying what inhabits a specific ecosystem will help you gain a better understanding as to whether or not the venue you’re scouting holds carp. Last but not least; try and find carp. If you see carp showing, jumping, turning, cruising on the surface, etc. Then you obviously know you’re in with a shot. But if you can’t actually see them (no need to panic), there are other things to look out for. Carp tend to give themselves away; as a constant train of bubbles is a good indicator that carp are feeding. These are just a few tips that will hopefully help you discover new fishing spots. But if the above information wasn’t enough of an inspiration to get you amped up; then I simply leave you with this specimen showcased in the cover picture of this article. This demonstrates the rewards that are there to be had. What are you waiting for? Get out there!